Top 10 Bollywood Songs 2018 Week 48 – Hindi Movie video songs with lyrics of all latest hit new film and album soundtrack. 26th – Nov 2018 to 2nd – Dec 2018. Mere Naam Tu Song is from the Bollywood movie Zero. The Star casts of this video are Shah Rukh Khan and Anushka Sharma. Director of this film is Anand L Rai. Abhay Jodhpurkar is the Singer of this beautiful track. The Lyrics has been written by Irshad Kamil. Ajay-Atul are the Music composers. Qaafirana Song is from the Hindi Film Kedarnath. It is starring Sushant Singh Rajput and Sara Ali Khan, While the Movie is directed by Abhishek Kapoor. The Song has been sung by Arijit Singh and Nikhita Gandhi. The Music Director is Amit Trivedi. Amitabh Bhattacharya is the Lyricist. Dil Chahiye Song is an album soundtrack. It is featuring Neha Kakkar and she is also the Singer of this new album song. Tony Kakkar is the Lyricist and Music Composer. Sweetheart Song is from the new Movie Kedarnath. The Star casts of this video are Sushant Singh Rajput and Sara Ali Khan, while the Film is directed by Abhishek Kapoor. Singer is Dev Negi. Amitabh Bhattacharya is lyricist. Amit Trivedi is the Music composer of this new music track. Jo Tu Na Mila Song is an album soundtrack. It is starring Asim Azhar, Iqra Aziz and Waleed Khalid. The Director of this video song is Yasir Jaswal. Asim Azhar is the Singer and Music Director of this new album song. Kunaal Vermaa has written the Lyrics. Tu Kareeb Aaya Song is a New Hindi Song. It is featuring Rishabh Srivastava and Aakanksha Sharma and they both are the Singers. Laado Suwalka is lyricist. Rishabh Srivastava is music composer of this latest song. Naa Samajh is an Album song. The Star cast of this video is Akki Singh and Annsh Shekhawat. The Singer is Akki Singh. Kunaal Vermaa has written the Lyrics. Kunaal-Rangon are the Music Composers. Lambiya Judaiyan Song is Latest Hindi song. It is starring Bilal Saeed, he has written the Lyrics and composed the Music as well. Izzat Fatima and Bilal Saeed are the Singers of this sad song. Chhod Diya Song is from the Film Baazaar. It is featuring Saif Ali Khan, Radhika Apte, Chitrangda Singh and Rohan Mehra in lead role. Arijit Singh is the Singer. Shabbir Ahmed is the Lyricist. Kanika Kapoor is the Music director of this Bollywood song. Zindagi Mil Jayegi song is Hindi Soundtrack. The Star cast of this video is Neha Kakkar and Tony Kakkar, While the Director of this album is Prakhar Khemka. Neha Kakkar and Tony Kakkar are the Singers. Tony Kakkar is also the Music composers and lyricist of this beautiful song. Our experts have created this list on the basis of response. 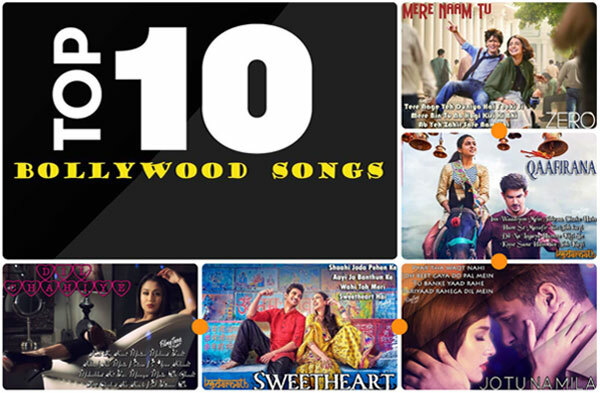 Kindly share your views to improve Top 10 Bollywood Songs weekly list. We are trying to serve you better.